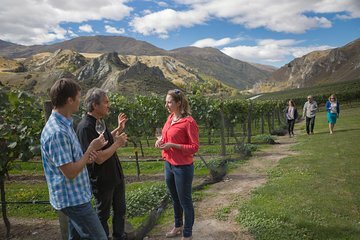 Discover some of the vineyards and wineries for which New Zealand’s fertile South Island is famous on this 4-hour wine tour from Queenstown. Travel from Queenstown into the South Island’s rolling hills with your guide. Visit a total of three wineries such as Gibbston Valley Winery, Mt Rosa, Waitiri Creek Winery or Chard Farm Winery. During your visits sample some of the delicious wines and cheese produced in the region, and gain insight into the delicate balances of scent and flavour at play in your glass. Returned to centrally located accommodation. My partner and I had a great time doing this tour. Our tour guide I can't remember his name was very friendly and knowledgeable. Our tour guide Rex was fantastic. He helped make this a very enjoyable tour. The 4 wineries visited beautifully displayed the quality of local wines. Great value for money. Outstanding tour with our extremely knowledgeable and funny gyuide, Lance. All 4 stops were great fun with lots of details offered by the wineries. The lunch stop in a winery courtyard. Very relaxing, great atmosphere and great food. On the way back to our hotel the whole bus was singing and having quite a party. Do this tour! Expensive trip, but you definitely get to see a lot of vineyards and get to try a LOT of different wines. It would be nice if lunch were included in the price. Great wine tour. Beautiful wineries and wine. Rex was a wonderful and knowledgeable tour guide as was all the wineries staff. Recommend for a delightful half day tour. AAA. Thank you to all. This tour was great. Our driver/guide was knowledgeable and fun. Comfy van. Visited 4 small vineyards, each with some unique aspect. Optional lunch was delicious and reasonably priced. Great setting for lunch. Lots of tasting! Well-run tour with personable, interesting guide to exceptional vineyards in a really beautiful environment. Great value with lovely, reasonably priced wines. Excellent tour - we visited some very good wineries. Great afternoon.